City socialite, Brian Kirumira aka Bryan White will have to wait until January 8, 2018 before his request for bail can be heard. The loaded socialite who is a suspect in the December 13, 2017 shooting was this afternoon appearing before a Magistrate's court in Makindye after he was charged with attempted murder, he denied the charges. Kirumira was charged with another policeman identified as Thomas Okoth. Bail could not be granted as court needed more time to peruse through the documents that his lawyers had submitted to court. Bryan White was to be one of the big spenders at Hamisa Mobetto's party that is taking place tonight, but that has not been possible. He was clad in a gray hood and black ripped jeans with a rosary. The time he spoke to journalists shortly after his arrest, slightly over a week back, he noted that he was responding to noise outside his gate only to see someone who had sustained a deep cut on his head after falling a gutter, he pulled out his Range Rover ride and rushed Victor Bitwire to Nsambya hospital. Shortly after, he was told to drive to the police station by the policeman who had come with them from the scene of crime. 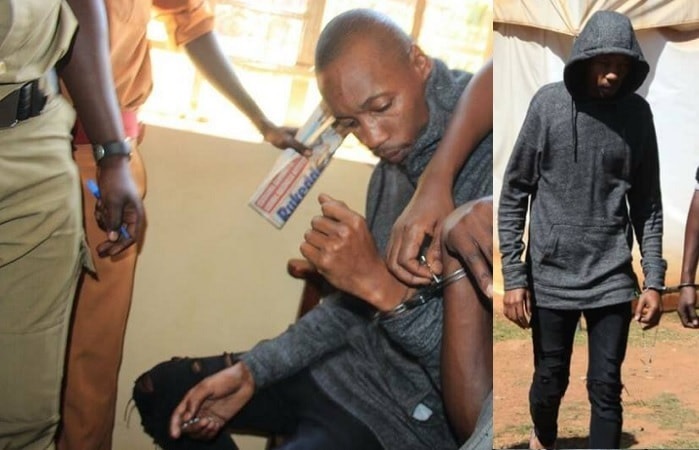 Bryan White had warned all those who thought had money that they were in for a big shock and indeed, he lived up to his word as he was constantly giving out cash to several groups, individuals and artists. Locals from Mubende where he hails from were planning to come to Kampala to stand with him during the troubled times.